The PM attended an investment promotion conference in Dak Nong on January 14 during his working visit to the locality. The conference brought together nearly 1,000 ministry and sector insiders, provincial officials, and delegates representing local and foreign enterprises. Dak Nong lies in the southwest exit of the Central Highlands, linking with Ho Chi Minh City and the southeastern region via highway 14, and Lam Dong and central coastal provinces via highway 28. It shares a borderline of 13 km and two border-gates with Cambodia. It has over 120,000 ha grown with coffee, 32,900 ha with pepper plants, over 2,600 ha with avocado, and over 7,000 ha with sweet potato. 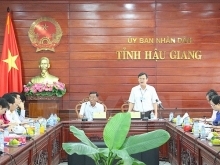 The province has two operating industrial zones covering a total land of 327.5 ha, and the over 800-ha Nhan Co 2 industrial zone which is being planned. It has adopted policies for hi-tech agriculture and aluminum processing industry, and completed a dossier on Dak Nong geopark for submission to UNESCO’s recognition as a global geopark. In 2018, Dak Nong posted a GRDP growth rate of 8.21 percent with average income per capita reaching 45.24 million VND, and collected over 2.3 trillion VND for the State budget. With such advantageous strengths and potential, Dak Nong wishes to draw more big economic groups to invest in the locality. PM Phuc said Dak Nong should increase the growing of avocado, pepper, coffee, passion fruit, and macca trees given its 650,000 ha of fertile land. Investors need to work together with local people to promote the development of hi-tech and organic agriculture to raise the added value of products. For tourism, the province should tap tangible and intangible heritages of over 40 ethnic groups residing there and mild weather, he said. Mining, especially the production of bauxite, which has reserves of billions of tonnes, should be the other way for the locality’s development, he added, showing his delight at the initial success of the bauxite production project in Nhan Co.
“To become rich and strong, Dak Nong needs to make the best use of its potential and strengths and have a bold mindset in investment,” he stressed. The province should speed up administrative reform and train professional staffers to assist investors, he said, suggesting the locality using advantages in the business environment to make up for disadvantages in infrastructure. The leader reminded the local authorities of developing trade, improving the quality of human resources, especially the public workforce helping them to have better management, and promoting the growth of private businesses. He asked the province to well manage immigration and unregistered workers along with protecting the environment and connecting with other regions for mutual development. “The Government is committed to creating all favourable conditions to develop infrastructure in Dak Nong and other localities ridden by difficulties. The Government will provide all possible conditions for investors to help them feel secured doing their business in localities,” the PM said. 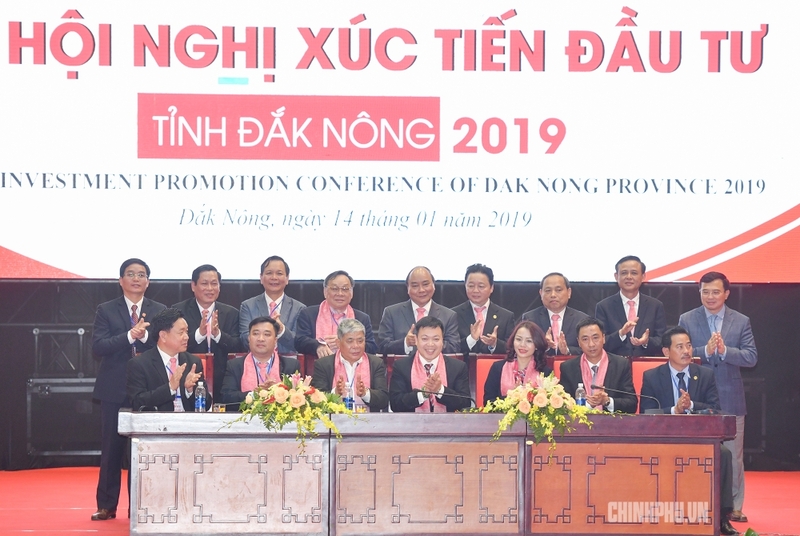 At the conference, Dak Nong’s authorities handed over investment certificates worth nearly 2.7 trillion VND, and signed investment commitments with big economic groups with pledged investment capital nearing 48 trillion VND.